First, thank you so much for all the wonderful comments about my wedding quilt - you have no idea how great it feels to celebrate this huge finish with more than my immediate family =P Lol. That's what's so fun about the online blogosphere, right? The quilt has been exchanged with Flying Purple People Eater for our bed and it's perfect! So.... binding... love it? Hate it? I'm in the middle. While I always enjoy catching up on TV shows which hand-sewing to the back, I'm all caught up right now with Orange is the New Black, Sherlock, Doctor Who, and Whose Line is it Anyway?... which means I have to watch repeats of Friends :) Not the end of the world! By the way, I've tried machine binding a couple of times, and I just don't have the patience for it - haha - maybe with more practice? I've been doing a ton of sewing this week, but now I'm at the binding stage for two quilts. Two nights ago I sat down and made the binding for both. This one is for my Arizona quilt - I've been hand-sewing for a bit of the last two nights. I'm excited for this one to be done and off to its rightful owner! 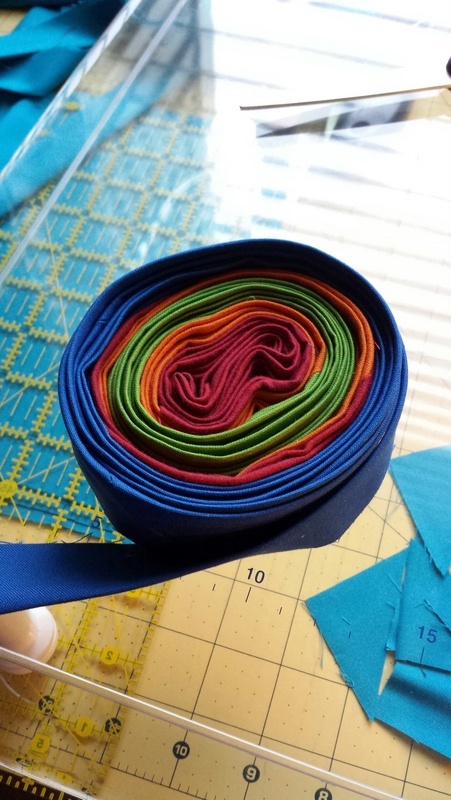 I'm matching the binding colors to the quilt in sections again, just like I did for the wedding quilt. Then, I finally finished FMQing chrysanthemums on a commission t-shirt quilt and started attaching this teal binding. I hope to share both of these quilts at the beginning of next week. 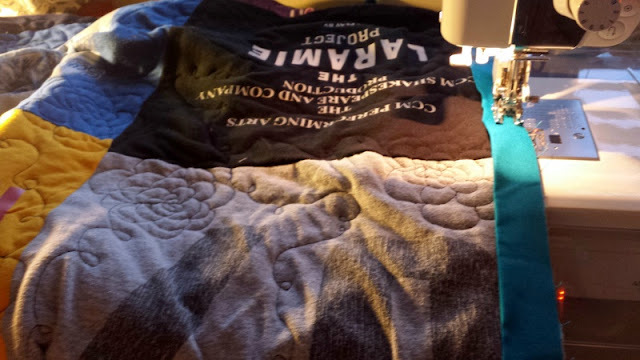 In case you are wondering, the t-shirt quilt looks fluffy because I don't use interfacing. I personally find it expensive and an extra step I don't want to take, so I've learned to cope with the t-shirt material. To each his/her own, though! If you have any questions, I'd be happy to answer them. Also, I forgot to mention that I bought a (very inexpensive - thanks, Kohls!) white hat for the beach, the same day we went to photograph the wedding quilt. 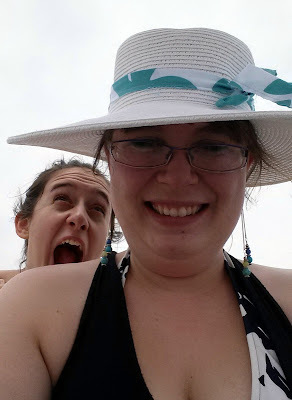 I burn like crazy and I wanted to read on the beach without getting a headache (can I get a "hear, hear?"). It was too plain for my liking, so I tied a strip of Marby in Jade from Glimma around it. I just folded it over and pressed it, so some of the edges are rough, but it does the trick! 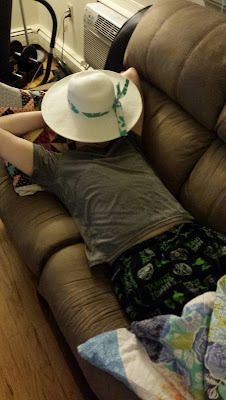 I found this husband person on my couch the night before the beach. Modeling. And yes, those are Plants vs. Zombies PJ pants! I hope to do some fun sewing tomorrow... with a pack of Sunnyside hexagons :D More on that soon... what are you working on this weekend? 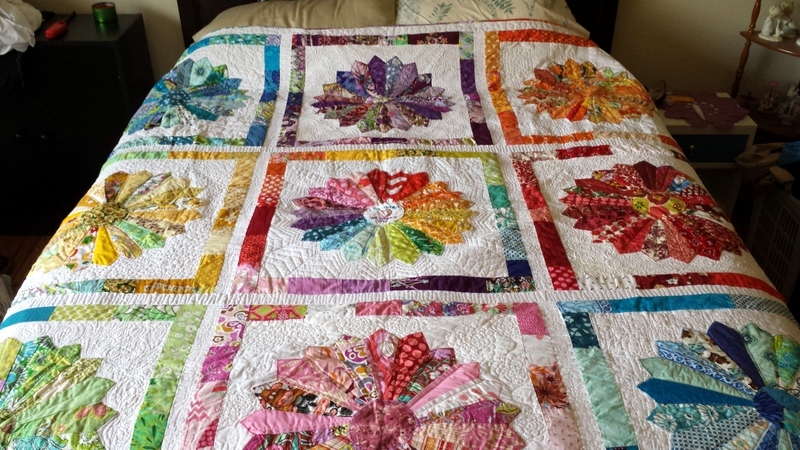 I so love that quilt! It looks fantastic in your banner! I love your quilt! I just might have to do one of those some times. Wait, I already have lots of UFO to finish first! I posted two posts to my blog today, the first one is a video on binding a quilt. check it out. I used to get so frustrated with binding and then I followed Patrick Lose's tutorial and I have never had a problem since. Like you Jess, I like hand sewing it because I can do it in the evenings when my husband is watching one of the shows I am not thrilled to watch...I sit by him and he is happy, happy, happy! The wedding quilt looks great on your bed! How much fun to be able to swap quilts when you feel like it!